Hand turned laminated dyed birch with walnut eyepiece and base. Polished finish. 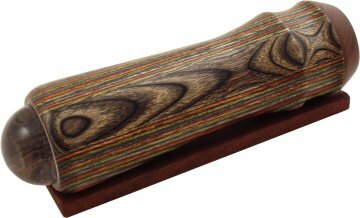 This beautiful teleidoscope is hand turned from laminated dyed birch with a walnut eyepiece. Teleidoscopes have a lens which gives a wonderful array of images when looking through the eye piece. Whatever you point the teleidoscope at, the colours and shapes will give beautiful, ever changing patterns. A truly wonderful gift idea. you are pointing the lens at !